GBP is being supported by the Brexit final negotiations while USD is also being empowered from hawkish FOMC update. 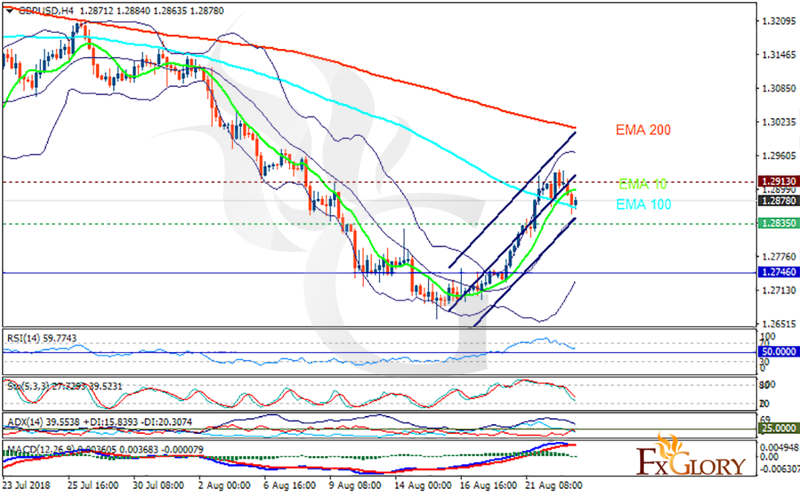 The support rests at 1.28350 with resistance at 1.29130 which both lines are above the weekly pivot point at 1.27460. The EMA of 10 is moving with bullish bias in the ascendant channel and it is below the EMA of 200 and above the EMA of 100. The RSI is falling towards 50 level, the Stochastic is showing downward momentum and the MACD line is above the signal line in the positive territory. The ADX is not showing any clear signals. 1.283 is a strong support level, GBPUSD will probably continue its bullish trend, leaving pullbacks on the way. Buyers can target the upper Bollinger band at 1.297.